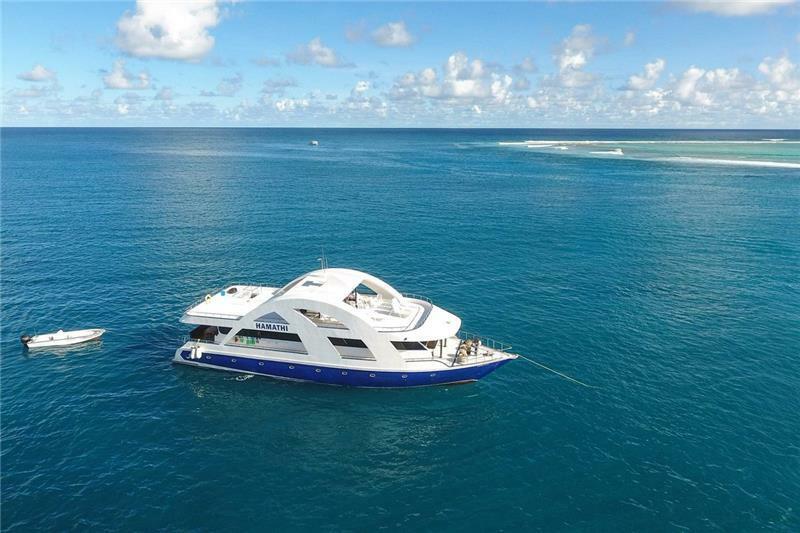 Celebrating 15 years of surf charters in the Maldives, the Hamathi will comfortably accommodate up to 10 surfers, but will travel with just 6 in 2019. 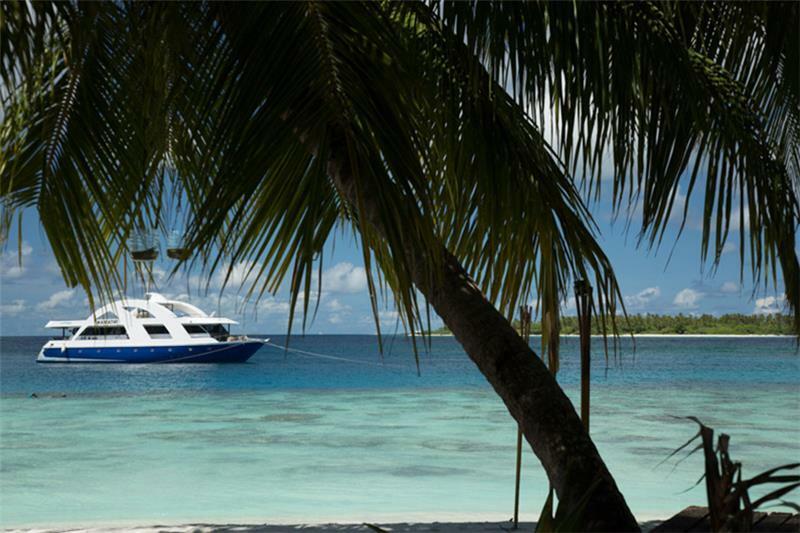 We have options for trips in the Southern, Central, and Male Atolls. It is an amazing surf charter boat with the bonus of an outside dining area so you can watch the surf while eating your meals. There are 2 sundecks for chilling and plenty of rack space for your board storage. If you haven’t been on a charter before you will see, having all these different chill out areas is a real bonus. Min 6 surfers for 2019 charters. 15 years of surf charter experience. Hamathi Safaris are based on chasing uncrowded waves in remote areas with Martey, the most experienced surf guide in the Maldives. Martey is the guide the other boats try to follow around the surfing points, but he is a stealthy operator and invariably seems to find the best surf with the least surfers. The Hamathi undertook a major rebuild in 2014 and the air-conditioning system was only installed in 2017. 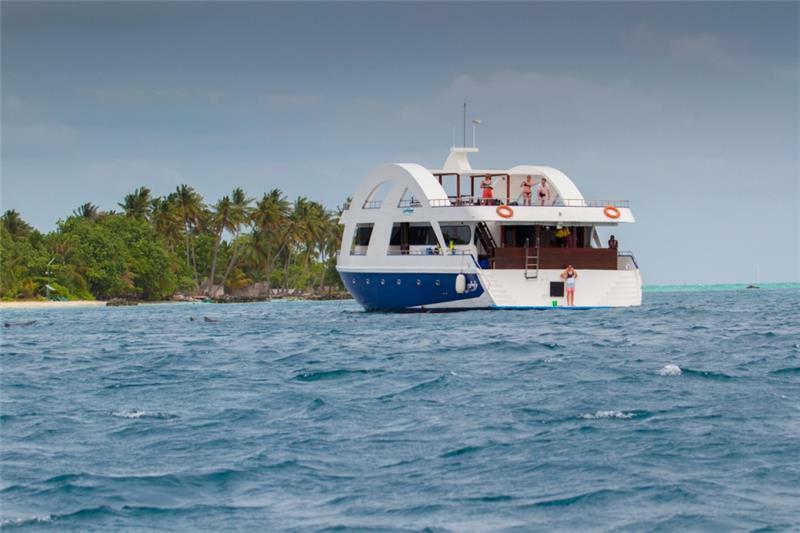 Hamathi will comfortably accommodate 10 passengers, but the minimum number of passengers required for an exclusive charter in the Southern Atolls of Gaafu Dhaalu is just 6! She’s a great surf charter boat with the bonus of an outside dining area so you can watch the surf while eating your meals. The lounge area has the normal facilities of TV, DVD and stereo for your entertainment and full bar facilities. There are 2 sundecks for chilling and plenty of rack space for your board storage. The Meemu, Thaa and Laamu Atolls offer spots exposed to all directions and for all levels. All spots in the Meemu Atoll are on a coast line facing to the east. There is always a left- or a right-hander well-protected from the predominant south westerly wind directions. South-easterly or even easterly winds may affect all spots negatively. All spots are close to each other so that you can change spots within a few minutes! The Thaa Atoll picks up south-west swell and may be even bigger than spots on east facing coastlines of other atolls. Due to its secluded location, it is almost guaranteed that you will not even spot another surf charter during your stay. The spots are well protected from North to Northwest winds. Conditions may be fickle with other wind directions. This area will be chosen only in very stable weather conditions. Spots in the Laamu Atoll are spread from the south facing coastline along the east facing up to the north-east corner where waves wrap around. As a result you will find spots protected from all wind directions except a rare straight easterly breeze. It is often said that the Gaafu Dhaalu Atoll (also named Huvadhoo Atoll) offers the best conditions of the Maldives. It works best in March, April, and September to November due to lighter winds, but has consistent waves all season long. It picks up more swell than any other Atoll in the Maldives and from every direction. The Gaafu Dhaalu area offers the greatest quantity and variety of spots. To almost every island on the outside of the atoll, you will find one or two breaks. There is everything from barreling and hollow walls to soft and never ending playful waves. After you arrive in Male you will fly down south where our guide will pick you up at the local airport in the Gaafu Dhaalu Atoll. Anchors are lifted and you head off to one of the main 10-15 breaks or to some of the other less known spots. The Gaafu Dhaalu Atoll offers the greatest variety of all atolls and most diverse breaks. You will find everything from mellow long board waves to the hollow barrels. Depending on the wind direction our experienced surf guide will find spots for you that are working best at the time. Most days, you will surf up to 6 hours or even longer if you can handle it! After some of the best surf of your life, you will be dropped off at the Gaafu Dhaalu airport and flown back to Male. For More information on the Southern/ Outer Atolls, with break descriptions and seasonality, please check out our Central & Southern Atolls region page. Why pick an area of the Maldives to surf when you don’t have to! We here at The Perfect Wave have created the “Total Maldives” trip. 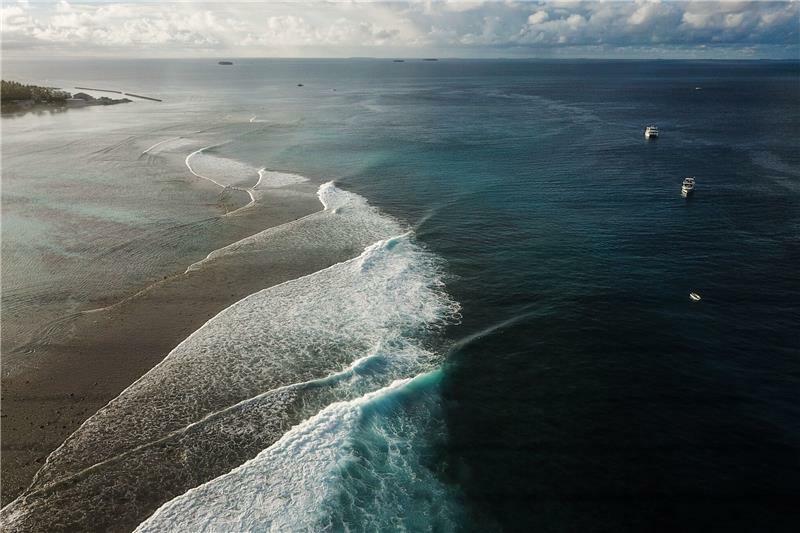 You can surf any atoll from the North Male to Laamu Atoll, or even further down south, if the conditions are good. 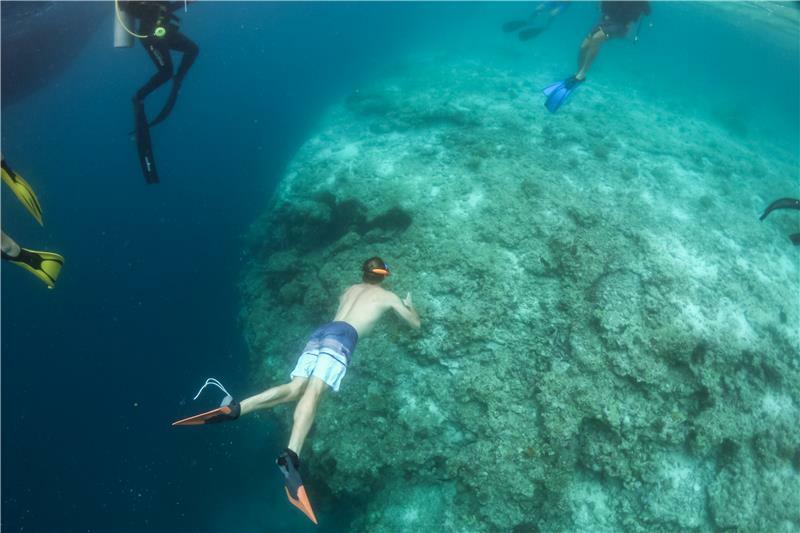 This trip is a fully flexible, no-limitations surf safari taking you to secret spots around the island paradise chain with just you and your mates for company, except of course the abundant marine life. The only limitations is the weather and nature and your surf guide will make sure to advise you which breaks work best under any given weather conditions. This is the first trip of its kind so be part of history and get on board Hamathi and experience this truly awesome surf destination. The captain of Hamathi has been doing boat charters in the Maldives forever! He is ultimately in control of the safari. He is supported by a second in charge, boat boy, and full time chef. The crew are all local Maldivians so know the area extensively and you can be confident of their skills & expertise. On the Hamathi, we have the most experienced surf guide in the Maldives, with 15 years experience all accumulated on safari boats, starting on Rani Safari and for the last 8 years guiding Handhu, Handhu Fahli and Cobia - Martey. 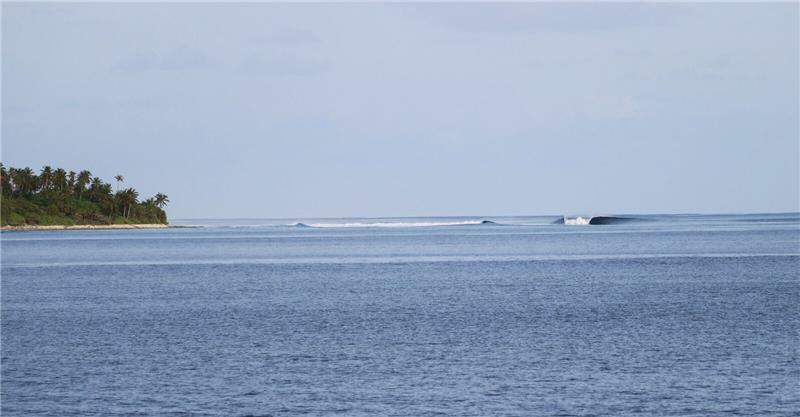 No surf guide has better knowledge of Maldives surfing points, in particular the Central and Outer Atolls which require expert navigation to find the perfect waves, than Martey. Meals on the boats are all-you-can-eat and are a mixture of Maldivian, Sri Lankan and western dishes. The chefs are also willing to adjust the menu to suit individual needs if required. Breakfast is tea, coffee, fruit, juice, toast and a mix of jams and omelettes of your choice. Lunch & dinner is a banquet of five different dishes with daily variations including fresh fish & tuna dishes, curries, rice and pasta dishes, vegetables and salads. Evening meals are followed by dessert and lunch is followed by a fruit dish. Tea and coffee is served after all meals. A hand of bananas ripen on deck. A full complement of alcohol is available for purchase. 5 separate twin cabins all with their own ensuite shower & toilet. The cabins are spacious and each bed has its own reading light. Each cabin is air-conditioned. Year built: 1999. Fully Refurbished in 2010 and 2014 to brand new standard. Size: 20.3m x 1.6m x 6.5m beam. 220v Power: 10.5kv Masse Sound proof Generator. Desalination: 5.5 kv Onan Sound proof Generator (backup). 02 Freezer / 01 refrigerator. Communication: VHF Radio/Mobile phone/CB radio. Cabin Ventilation: Ceiling hatch and side windows. Dingy with 25hp outboard engine. The dinghy is available at all times to guests. On a surfing safari, primarily it is for getting surfers to the breaks, however it is also used for fishing, snorkeling, island visits and any other purpose guests may wish. Diving facilities (on request – please advise at time of booking). If your group as a whole wants a diving dhoni to accompany Hamathi, this can be arranged at extra cost. (It can be an expensive way of doing it if you only want a couple of dives while on a surf safari.) If just some of your group want to scuba dive, they might be better off going to a resort with diving facilities during the trip, or before/after it. Basic fishing gear (lines, hooks & weights). Please bring your own if you are a serious fisherman. Please note that maximum size of surfboards allowed on Maldives domestic flights to Central and Southern Atolls is 8 ft including the boardbag. - Local Photography service. US$50 for 10 photos of your choice. US$100 for full suite of photos. Camera used is a Canon 70D SLR and photos will be taken from land, boat or tender. - Alcohol is available for purchase on board. If you have any special requests, please let us know well in advance and we will do our best to organize your favourite brand. For reference 1 beer usually costs US$4 per can. - Snacks: There are a range of snacks available such as Mars Bars and Twix bars on board to purchase. - Kandooma Buffet: "All you can eat and drink" seafood & Champagne (Moët) buffet at Kandooma Resort is available on Wednesdays. The cost is about $110++ per person. Food: Meals on the boats are all-you-can-eat and are a mixture of Maldivian, Sri Lankan and western dishes. The chefs are also willing to adjust the menu to suit individual needs if required. You can advise us after you book if you have any allergies and we can advise the chef before your trip. For Breakfast, tea, coffee, fruit, juice, toast, cereals and eggs and/or pancakes are provided. Lunch & dinner is a banquet of five different dishes with daily variations including fresh fish & tuna dishes, curries, rice and pasta dishes, vegetables and salads. Meat dishes are provided but usually we try to provide fresh food from the local environment. Evening meals are followed by dessert and lunch is followed by a fruit dish. Tea and coffee is served after all meals. A bunch of bananas ripen on deck and you can eat these as you wish. Water is also free and you will be given your own Perfect Wave water bottle on arrival which you can put your name on and refill as you wish. This helps save the local environment from the pollution of using plastic bottles. A safari is a journey or expedition, in this case, looking for "perfect waves." Your surf guide on Hamathi is Martey, the most experienced of all surf guides in the Maldives and it is his and The Perfect Wave's mission to find the best surf points with the least surfers present. On safari, Hamathi is free to move whenever to wherever to achieve this result. The Central Atolls is a large area, it includes Laamu, Thaa, Dhaalu, Meemu, Vaavu and Sth and Nth Male Atolls. On this trip you will see a great deal of the Maldives, many uninhabited Islands and villages and the expedition direction will be dictated by the surf conditions. The trips require minumum 6 passengers to guarantee the departure. Price do not include international flights. Central Atolls trips include one way domestic flights. Southern Atolls trips & Southern to Central Atolls trips include return domestic flights. Prices above are per person prices based on an exclusive charter booking. Prices are subject to foreign exchange fluctuations until paid in full. Charter duration can be flexible - please ask your consultant for a customised quotation. 30-foot surf & dive dhoni available for hire - minimum 2 weeks notice (US$250/day). Please note that maximum size of surfboards allowed on Maldives domestic flights to Central and Southern Atolls is 7 ft including the boardbag. Food was excellent, the curries were amazing. Martey got us on the best waves that were around he did a fantastic job. The crew were terrific, really friendly guys well mannered and attentive. Ill send a few photos when I have a look. I really loved the trip - I wish I could go back - i really would like to go Next year again, again with the Same boat and Martey as a Surf guide, Never had such a good one. The group was awesome, the crew always looking for your needs (e.g. Showing us spots to See Manta Rays...), Martey Even offered me his room, so that I did Not have to share ist with another guy..... Looking for spots, where the others and me in the Same Time were able to surf; offering me his boards, as I did not have a longboard with me - and always giving me tips to improve same as the rest of the group. The food was really delicious and I cannot recall, having ever eaten that much. I really liked the design of the boat, always having shade somewhere on the top. The Perfect Wave helped arrange a great boat trip for myself and my friend at very short notice. Help with airfares and airlines to use etc was much appreciated. Our NZ agent Glen has a lot of vibrant energy and is great to talk travel with and gets you amped on your trip. We were fed like kings on the boat, our surf guide ensured we were at decent waves every day, and as a result it was a full on 8 days of surfing. Perfect! Just got off the Hamathi Maldives 7day trip with Marty as our guide. What a trip, great waves great fun enthusiastic guide who when he finally came out from behind the camera ripped the joint to bits. He was excellent, great advice!! Great local knowledge that got us in the perfect spot to pinch all the waves. Great attitude toward not only his job but the boys on the boat us and his crew!! His crew get an A+++ for there effort and happy go lucky attitude. They really felt like a part of our group by the end. Highly recommend Marty and the Hamathi!!! 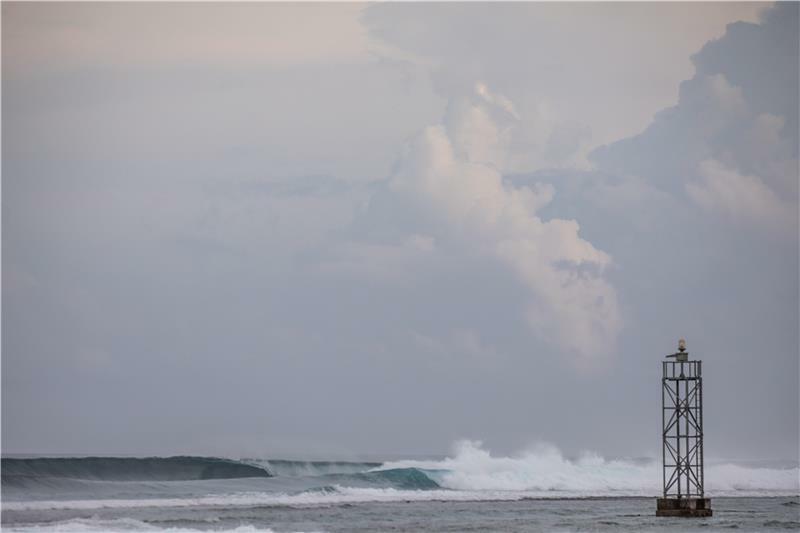 Fantastic reef breaks, beautiful warm water and more power than I expected from the Maldives. When our swell finally hit we were all stoked with the waves and the froth ran freely. I enjoyed staying on the Hamathi very much. I ended up staying on the same boat for 17 days and had very good waves for most of the time. The crew on the boat was very nice and cooperative and our surfguide knew the area very well. I had an awesome time on the boat and would like to come back very soon. Thank you for the incredible time on the Maldives! We had a magic trip, even though the waves did not get over 4 feet, we had consistent waves throughout the entire week. Martey and crew kept us entertained through the night & day taking us fishing & making the right calls on where to avoid the crowds & to where the spots the winds where best. I will be back on the Hamathi again for sure! Thanks for organising a great trip on Hamathi. Marty is the man for good, uncrowded waves. When it was on we were there. Surfed most days. really good on the second half of the trip. His crew are all legends, the other guests were all a great bunch of guys too. After 6 full-price trips booked through TPW over the past 3 years, I was very happy to be able to take advantage of the free 10-day charter offered by TPW on the Hamathi in the Maldives. As usual, TPW did a good job of booking the flights, transfers and stop-over hotel at short notice; the end result being that the trip ran smoothly from start to finish. The Singapore Airline flights from Australia to the Maldives and back are well-timed and comfortable. The transfer from Male airport to the Hamathi and the return transfers to the stop-over hotel and airport were on time and comfortable. The stop-over hotel in Male, Le Vieux Nice Inn, was clean and comfortable and the staff were very helpful with the only issue being that they can not sell any alcoholic beverages, a draw-back for Aussie surfers. The Hamathi is a spacious and comfortable surf charter. The boat crew are fantastic; they were friendly and helpful and kept the boat clean and in good running order. The chef too is very good, providing a variety of well-prepared dishes at each meal, as well as across the 10-day charter with not too many repeats. With plentiful good food there is no reason to go hungry on the Hamathi. Martey seems to function reasonably well as a surf guide, albeit that the boat did not leave the North Male Atoll breaks on our trip. Given that there was enough swell throughout our trip, Martey used his knowledge of winds, tides and currents to put us in the best waves each day. However, the North Male area seems to be an 'easy call' for the charter boat operators and hence there is always a multitude of boats, which leads to relatively crowded line-ups (20-30 surfers for much of the day at each of the 5 non-exclusive breaks). TPW needs to be clear with the clientele about the operating range of the charter they have booked on (eg. North Male Atoll only or will sail south depending on conditions and clientele requests; there seemed to be some confusion around this issue on our trip). The Hamathi has a good selection of functioning snorkeling gear and a fair selection of reading material, but was lacking in its fishing equipment (particularly trawling rods) and movie library. The boat could do with a second run-about (ie. Zodiac) to provide more flexibility with access for the various clientele to different surf breaks. Also, it seemed to be one of the only boats in the area that did not provide surf photography for the clientele. Having said all of that, the trip itself was great, surfing multiple times most days (32 hours in 10 days). 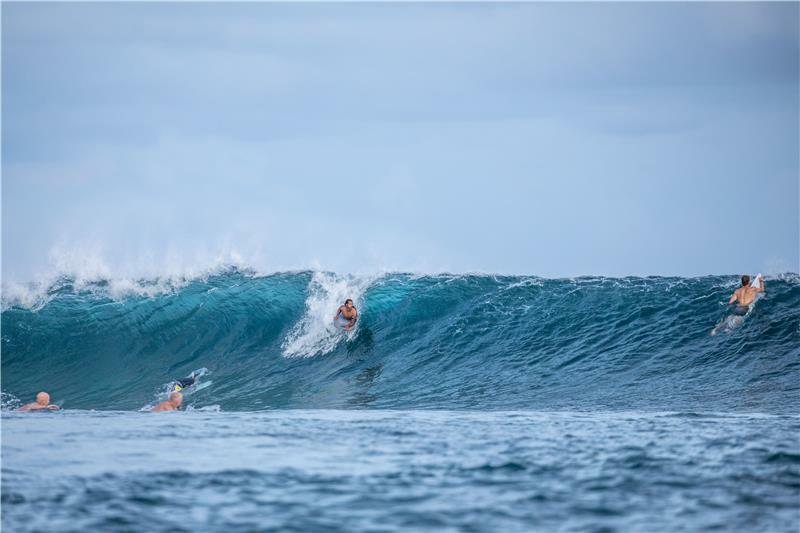 As an experienced surfer, I was able to get my fair share of the good 2-4' waves among the 'crowds' and very much enjoyed surfing the North Male breaks which I had not done before. I have no doubt that I will book future surf charters in the Maldives, but focused on the Central & Southern Atolls. Once again, I would like to thank TPW for giving me the opportunity for an inexpensive surf trip in the Maldives, I'm very grateful and still buzzing. The surf charter boat the Hamathi lived up to expectations with a great crew , knowledgeable surf guide & great bunch of surfers . First to the break everyday , plenty of healthy food & cold coronas , The rest is up to Mother Nature . Thoroughly recommended as an introduction to the Maldives. Perfect Wave worked with us to ensure we had the right trip matched to our expectations and skill level. Both the boat and surf guide were awesome. Waves were fun, manageable and enable me to progress my surfing to the next level. Can't wait until my next trip with Perfect Wave. Recent trip on the Hamathi was incredible. We surfed everyday, with the majority of surf being in the good to excellent range. Our guide, Marty, did his best to get us to the best waves and best conditions. Aside from the surf, the crew were top class, and some of the locations are the most prisitine I've ever been to. Hope to be back soon! Had an epic time again with the perfect wave my 2nd trip in 2 years and once again it was seamless and non-stressful right from the time I got off the plane. The rep is there to give you your itinerary and guide you to the boat and help you if you need anything. Once on the boat, same as last year, i was welcomed with drinks and introduced to the crew then a quick briefing on what the conditions are likely to be like from Marty a superb guide who knows every break intimately. He put us on the best break everyday sometimes with no one else around. It was a glorious 10 days great waves every day. The Maldives is a wave machine, the crew were great, the food was good and the beers flowed in the evening can't wait to go again. I'm dying to go again asap lol. Had a great time! Didn't get a big swell, but our surf guide worked hard to take us to where we did get surfable waves without too many other boats. 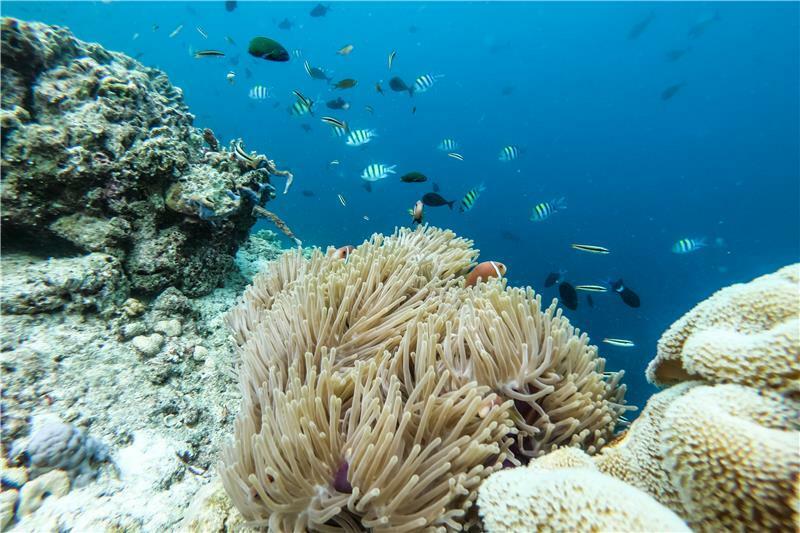 The locations are amazing with excellent marine life and snorkling. All you have to do is surf, eat, sleep, and repeat. We will be doing another one of these trips! 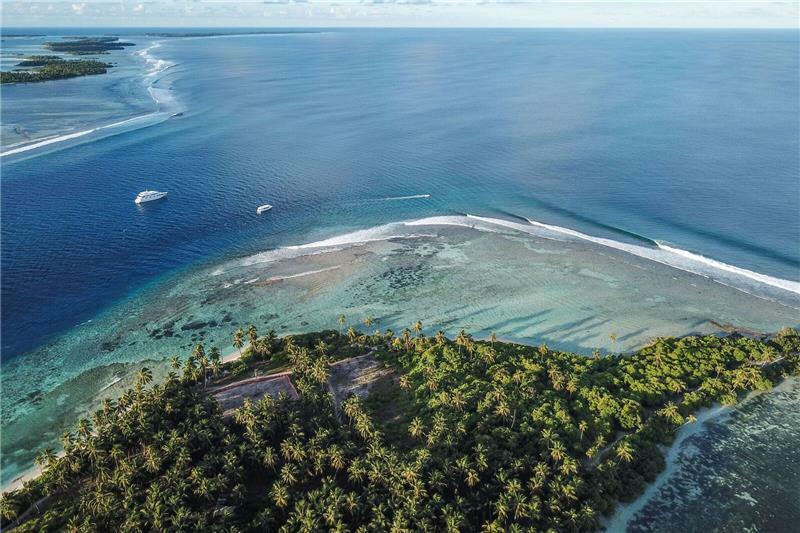 We sampled a wide selection of breaks all across the male and central atolls, and our local guide Marty McFly always got us to the best waves. He was constantly pouring over charts and buoy forecasts, putting the options in front of us with local knowledge about how things might favour the intricacies of each different setup. I surfed 90% of the days I was there, ranging from waist high to overhead, and conditions were most times perfect and relatively uncrowded ... a few solo sessions too! Crew are all super friendly, and the food is just what you want; plentiful, healthy, lots of fish and local dishes mixed in with general surf chow. A lot of freshly caught and perfectly cooked fish graced the table. Always go for the cheek and the eyes. Suffice to say, after 10 days and nights on the Hamathi, I couldn't help but stay for another 10... and I'll be back again ASAP. Awesome. I can't really add anything. The crew and Martey were all just on top of their game. We managed to surf 9 out of ten days. Having to shelter a storm for one day. Food was amazing. THIS WAS OUR 2ND TRIP WITH TPW,THIS TRIP WAS EVERTHING WE HAD PLANNED FOR,MARIE WAS AVAILABLE TO US FROM START TO FINISH,NO MISTAKES,NO PROBLEMS AT ALL. MARTEY OUR GUIDE IS PRICELESS BUT DONT TELL HIM THAT. THE BOAT AND CREW REALLY LOOKED AFTER US OLD GUYS IN AND OUT OF THE SURF. THE FOOD WAS BY FAR THE BEST OF THE THREE TRIPS WE HAVE BEEN ON. 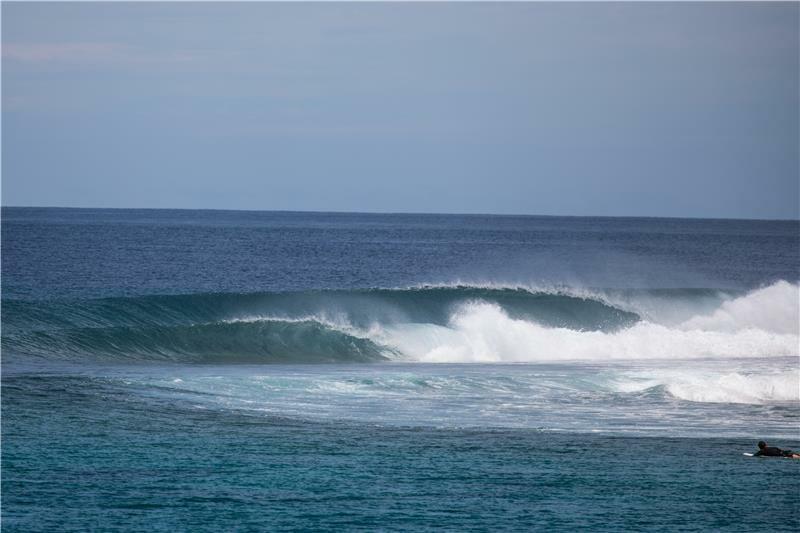 THE SOUTHERN ATOLLS IS MY PREFERRED DESTINATION IN THE MALDIVES,GLASS EVERY DAY AND GREAT WAVES. This was my third boat charter to the Maldives, all with different companies, and I have to say that The Perfect Wave impressed me the most. Martey, the surf guide was fantastic, a genuinely friendly guy and more importantly, he found us surf to ride 11 out of 12 days, often 2 surfs a day. The staff was again caring and thoughtful, nothing was too much trouble and always looking out for us, so we had nothing to do but surf, eat, take in the amazing surroundings and rest up to do it all again. On one day I paddled back out after an amazing ride and said to Martey," I just rode the perfect wave". I thought how appropriate it was, that my perfect wave, had been delivered to me by 'The Perfect Wave'! Thanks for a great trip, hope I can do it again one day. We had great time onboard the Hamathi. The crew onboard did a fantastic job, our room and on-suite was keep clean to a high standard. The food was great and most request catered for. Marty our guide was full of information and knowledge regarding the surf swell and breaks. We end up getting some playfull but challenging waves throughout our tour. Quality fun waves, good crew & guide, food great, dam I'm back to reality....Keith. Super satisfied!! It was more than just a surf holiday but a full encompassing trip . Will be back!! My trip in Oct 2014 on the Hamathi was very cruisey. Most of the other passengers were unknown to me but everyone got along well. The waves were generally what I expected for October, and I got my share. I was surprised by the crowds in the North Male breaks and pleased to get away south on the Total Maldives package. Food was excellent as well as the crew. The boat was very comfortable and between surfs I found a number of different places on the boat to sit back and read. A few of us on the boat took fishing gear as well. We got some GT's, barracudas, sweet lip, squid, and had a 4 ft Wahu that broke off as it was being lifted into the boat. great trip. It was really easy to book my trip with The Perfect Wave, the staff are extremely helpful and nothing is a hassle! I would book a trip through perfect wave again. A mind blowing experience. This trip was the BOMB and I loved every minute of it! The lead up was perfect, thanks for all the information and correspondence to make sure we were well prepared for the trip. As a first timer I felt in really good hands! The surf guide was fantastic and the crew were just amazing! The trip far surpassed my expectations and I came away from my trip with a new found love of surfing! I learnt so much and did so many amazing things in the 10 days and I'd recommend it to anyone! What are you waiting for, I'm already saving for my next trip! !